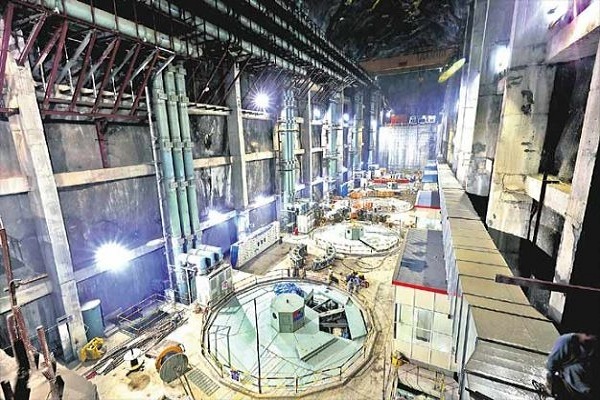 The pace of works on the multi-package Kaleshwaram Lift Irrigation Scheme (KLIS) which had slowed down after the August rains has once again gained momentum after the flood level in Godavari receded considerably. 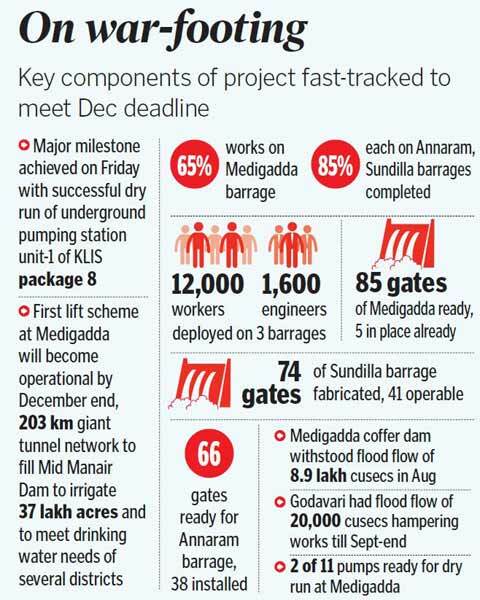 Three major barrages – Medigadda, Annaram and Sundilla – that make the key components of the Rs 80,500 crore project are back in focus with works being implemented in round-the-clock shifts. All the key components in the project that hardly has 80 days left to meet the December deadline have been fast-tracked to release water at least partially to its ayacut as per schedule. A major milestone was achieved on Friday when the dry run of the underground pumping station unit-1 of the KLIS package 8 was successfully held under the supervision of Government adviser (Lift Irrigation) K Penta Reddy and Chief Engineer N Venkateshwarlu. The dry runs of three other motors were successfully completed earlier. Over 12,000 workers and 1,600 engineers are part of the workforce deployment in the three barrages under construction. The work progress is as scheduled, project officials, giving an update on the prestigious project, told Telangana Today. The first lift scheme at Medigadda will become operational by December end. The erection of crest gates on Medigadda barrage has been put on fast track. Fabrication of all the 85 gates were completed by the first week of October under the supervision of a panel of engineers. Erection work has also been completed in respect of five gates. The coffer dam constructed at Medigadda lift irrigation scheme to avoid impact of heavy flooding was in fact designed to withstand a flood of 9 lakh cusecs. The highest flood of 8.9 lakh cusecs was experienced when Godavari was in spate in August. Undeterred by the floods, the implementation agencies carried out all components of works as per schedule barring the earth and concrete works. The Medigadda stretch of Godavari river had a flow of 20,000 cusecs till the end of last week and it is receding further raising hopes of resuming all pending earth works and concrete works on the barrages and lifts. At Annaram barrage, in all 66 gates have been proposed as part of the design. The fabrication of all the gates has been completed, and 38 gates have been erected. The work progress is as per schedule, the officials said. At one point of time, non-availability of workers was a major problem, but the issue was addressed by pooling manpower from various places and other States. So far as the Sundilla barrage is concerned, fabrication of all the 74 gates have been completed, and 57 gates are in place, while erection of five other gates is in progress. Work on another 12 gates is in balance. In all 41 gates have been made operable.